An absolute colossus of a machine, piloted by graduates of the Ves’oni’Vash, the KV128 Stormsurge is designed as an extreme heavy-weapons platform. Not as maneuverable as a Riptide, instead relying on thick armour and devastating loadouts, these hulking, squat ballistic suits are capable of changing the course of a battle in seconds with a decisive volley of astonishing firepower. 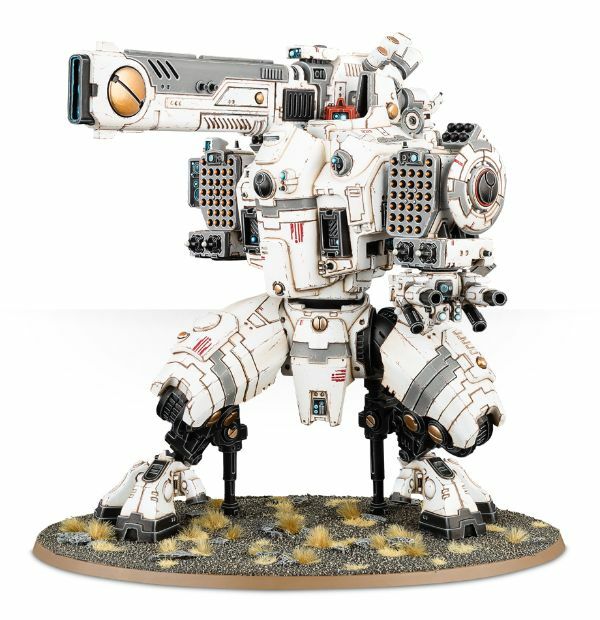 Fitted with thrusters to counter recoil, bristling with pulse weaponry and missile pods, the Stormsurge is the Tau Empire’s Titan-killer. This multi-part plastic kit contains all the components necessary to build one KV128 Stormsurge, ballistic suit of the Tau Empire. It includes an astonishing 171 components - four head options, two pilot assemblies, a reactor suite, two leg assemblies and two sets of stabilizing thrusters! Various vents and assemblies can be modeled optionally closed or open, and the whole miniature has incredible possibility. Includes one Citadel 170mm Oval base. #GAW 56-18 - Price: $ 150.00 - $ 120.00 On Sale!